One way to improve sagging camera sales is to drop the price, especially here in the US where the dollar gain against the yen helps make up for some of the price differential. We're going to see bouts of this rebate madness at various times all year, typically in mid-quarter I think (e.g. February May, August, November/December). That said, there are some really good deals happening at the moment. If you missed my picking apart the Nikon Lens Rebates, be sure to see last week's article on Nikkors you might want to consider. Keep reading for some other deals (skip over the B&H link. Meanwhile, serious prosumer customers are looking more and more at the mirrorless alternatives, and sure enough, there are some very significant rebates available for those, too. Top considerations: 14mm f/2.8, 23mm f/1.4, 60mm f/2.4. 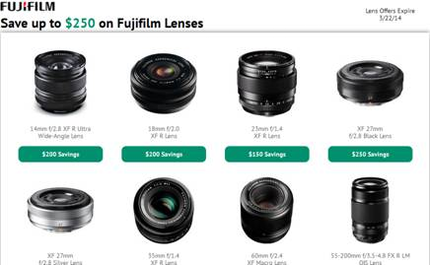 These are all excellent lenses, though the 60mm may be a bit slower to focus (it's a macro lens, though). Worth considering: 18mm f/2, 27mm f/2.8, 35mm f/1.4. Nothing wrong with the 35mm f/1.4, but it's just a fast normal lens, which is my least favorite focal length. The other lenses are more pancake (slower aperture, but small). Optically, they're good, and the 27mm f/2.8 actually is a slightly better "normal" in my mind than the 35mm f/1.4, as technically "normal" ought to be the diagonal of the capture area, and the 27mm is closer. Plus it's a low cost lens that delivers great performance. Probably don't consider: 55-200mm f/3.5-4.8. Good optically, but it's slower to focus on most of the bodies than I think DSLR users would like, and Fujifilm has other telephoto zooms coming that look more interesting. 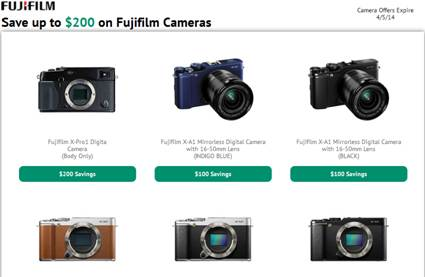 The Fujifilm camera rebates are a little more problematic, as they're not really on bodies that the DSLR user would probably be interested in (X-A1, X-M1). The X-Pro1 probably comes closest to what a DSLR user would want, but frankly, I think the X-E2 and just announced X-T1 are the bodies you probably really want. But wait, there's more! It really is rebate-alooza. Olympus is next up. The OM-D E-M5 is currently running a US$200 rebate, putting the body-only price at US$800. I would tend to tell you to avoid the two body+lens kits that are available under the rebate and just add your own lens. The classic 24-70mm f/2.8 equivalent would be the US$1000 12-40mm f/2.8 Pro. But another excellent route would be to just stack up the f/1.8 prime set (12mm, 25mm, 45mm, 75mm), which totals up to US$2300. But that's one heck of a great set of primes (there's also a 17mm f/1.8). But more important, these are all relatively small lenses for what the do (remember, m4/3 has a 2x focal length adjustment, so you'd be getting 24mm 50mm, 90mm, and 150mm). None of the great Olympus lenses currently have a rebate on them unless you buy them with an OM-D body. Panasonic is also running a small rebate on the GM1 with 12-32mm lens. This is a very small camera that's actually quite a good performer. If you're looking for a compact with a big sensor, the Panasonic GM1 should be on your list. Which brings us to Sony. Sony's big rebate at the moment has to do with the A7 and A7r: buy those cameras and a lens together and you get US$200 off a lens. Unfortunately, there are only four lenses "currently" available (the 24-70mm f/4 is still on a pre-order status in the US). That said, two of those lenses are stunners. The 35mm f/2.8 at US$600 with the rebate may be the best 35mm full frame lens I've used. The 55mm f/1.8 at US$800 after rebate is right up there, too. I can't speak to the 24-70mm f/4 as mine hasn't shipped yet. I can say that the 28-70mm f/3.5-5.6 is a bit of a yawner. It's a kit lens, and it performs like one (the US$300 price after rebate ought to be a giveaway). That said, if you're going to move into a A7 system, the 28-70mm might be worth getting to tide you over until more lenses arrive and you can make a more intelligent decision. So, what's the real story here? Simple. There are a lot of good bargains floating around, both in the Nikon DSLR lens lineup as well as the other likely places you might decide to migrate to from a Nikon DSLR. As I wrote earlier, to gain market share in the current environment, a camera company has to steal it from another camera company. One of the ways you're going to see them trying to do that this year is by pricing. We're seeing discounts on new gear faster and faster these days, so you need to keep your wits about you and shop carefully. Here's the thing: for interchangeable lens cameras (DSLRs and mirrorless), the lens is the app. What I mean by this is that just like apps drive smartphone and tablet (and even desktop) usage, lenses drive camera usage. So the one thing I'd point out is that Nikon, Fujifilm, and Sony are being pretty aggressive with lens rebates right now. They all have some very good optics on sale. You may update your body in a year or two, but you're less likely to update your optics (especially if you buy right when they're on sale like they are now). So take a good long look at those lens rebates before you dismiss them. Even I picked up another lens I didn't own when I saw all these rebates pop into my email flow. One final thing. Why did I write that we tend to see the rebates more aggressively in the middle of a quarter? The first month of a quarter the companies are heavily analyzing how they did the previous quarter, adjusting production schedules, and figuring out how they're going to proceed to keep the current quarter's numbers from slipping. The last month of the quarter is a bit late to scramble for more sales, because you really don't have any time to evaluate how the program is working and make adjustments. So you launch your new rebates in the middle month and tweak them in the last month of a quarter, as necessary. Moreover, January and October are already awkward months. Dealers are still trying to recover from the Christmas rush and figure out their own year end figures in January, and you want to save your big deals for the Christmas shopping that picks up in November, especially late November. July, everyone's on vacation already: you really wanted to sell them a camera in May/June.